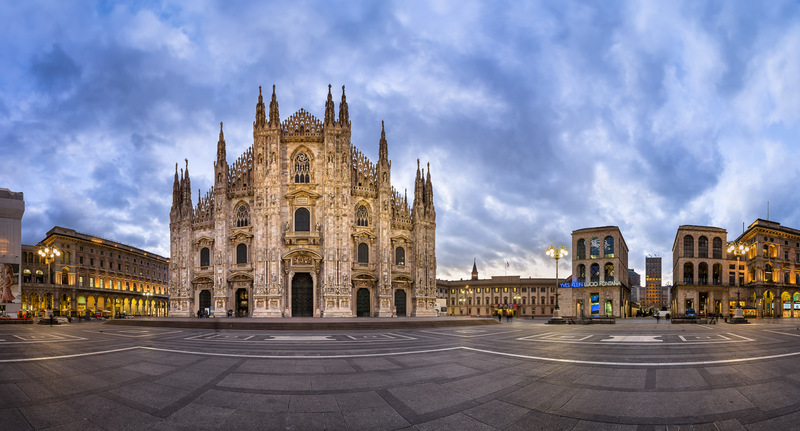 Located on Piazza del Duomo in the very centre of the city, Duomo Cathedral is the third largest church in Christendom (outdone only by St Peter’s in Rome and Seville’s cathedral). This site had been associated with places of worship since the third century: a Roman temple to the goddess Minerva once stood here. Duomo construction began in 1386 and it was consecrated in 1418, but remained incomplete for centuries. Finally facade was put on the church only in 18-th century by order of Napoleon who was crowned as a king of Italy here in 1805. Today piazza del Duomo is a very busy and full of people all day around. The only chance to get a decent photograph without crowds is to come before sunrise and use long exposures to remove moving people. Panorama from 4 vertical images, additional exposures for highlights, focal length 17mm, aperture f/8, shutter speed 2 seconds, ISO 100, tripod, pano head.